Different to the un-mounted workshop, in that this is carried out in and arena with a horse or two present. There are so many ways and means of improving a horse’s way of going, beyond just riding. In these workshops, we will unravel the mystery of many of these methods, beginning with simple steps, such as making sure the horse understands stop and go. If the same riders are having un-mounted lessons over a series of several days, clear improvement can be seen. Lateral work can be introduced, suppling and loosening the horse. Work on the lunge can effectively change the way in which the horse works, and this is addressed both by using two reins, and by lunging in a simple rope halter. Handlers will see how they can become more or less effective by changing their own body language and positioning in relation to the horse. Learn to read the horse’s body language and see the signs that show a horse is working more correctly. A comparison can be made, lunging a horse using tradition side reins and then changing to a rope halter. The long reining is taken a step further, to where the horse is driven around the arena, the handler walking behind. 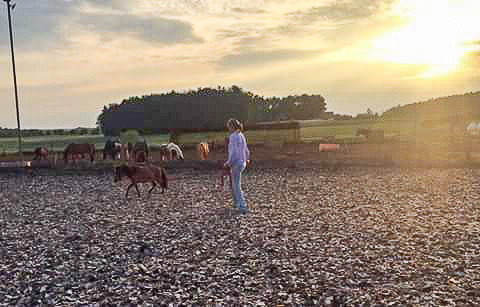 In this way, the strain of working in a circle is eliminated, straightness can be improved and the trainer gets a different view of how the horse is working. If the horse is advanced enough, lateral work can be introduced. At any level, all the participants should go home with various ideas of what they can be doing with their horse at home.